Fort Atkinson Nursery | Winneshiek County Development, Inc.
Fort Atkinson Nursery — 65 acres of trees and hardy perennials spread out on the bluff above Fort Atkinson, Iowa — is one of those rare businesses you won’t find on the Internet (yet) or social media. Situated on the edge of a residential neighborhood, across the street from its namesake, historic Fort Atkinson, its ‘traffic’ is still directed by handlettered signs indicating the shop and office. 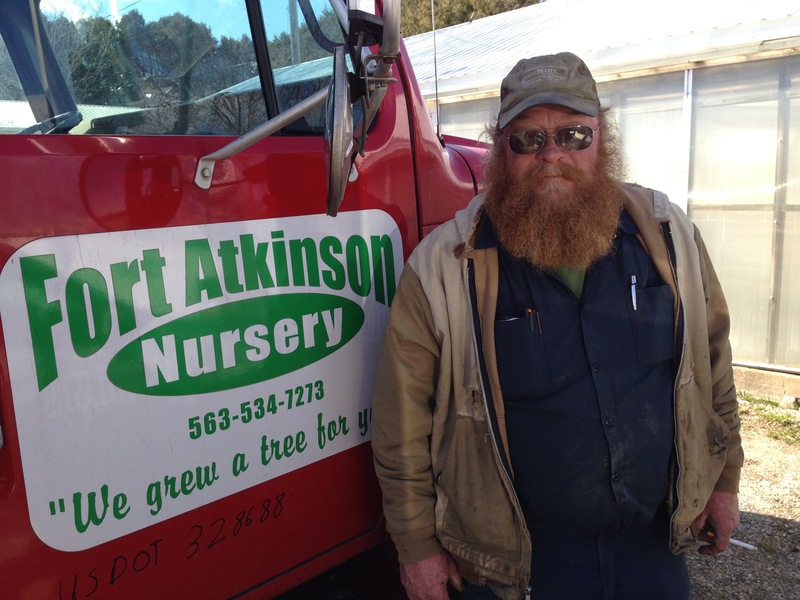 But don’t mistake it for ‘sleepy.’ Those guideposts put you in fast proximity to the nursery’s number-one selling point: the knowledge that runs deep in its people, especially fourth-generation owner-operator Scott Sindelar. Five minutes inside his orbit — his encyclopedic knowledge coming at you rapid-fire through the muffle of his bushy beard, peppery red hair battened under a hard-worn ball cap — and it’s clear his experience is as native as the trees and plants they sell. One minute, he’s negotiating the cost per unit of a large installation of spruce via cell phone, and the next he’s cataloguing customized deer deterrents (Liquid Fence, Plantskydd, the occasional shotgun). He takes calls on the office landline, which is answered by his father, Joe, from whom he bought the business in 2015. The two consult in a familiar shorthand of pricing and plant species. Outside, seasonal crew members shuttle equipment between projects, checking with Scott as they buzz by. They still use a narrow-front John Deere M and Jiffy Baller digging implement purchased new in 1949. Today Fort Atkinson Nursery specializes in wind-hardy evergreens, particularly arborvitae, and ornamental varieties — like Scott’s favorite, the autumn blaze maple, whose large, graceful leaves turn rosy gold in fall. They also trim and maintain more than 500 commercial and residential installations each year, and shape and spray trees for 25 orchards. After hours, Scott does landscaping consultation on location, helping owners plan for a long-term investment. They’re also the proud donors of Black Hills spruce seedlings distributed to the area’s first graders each Arbor Day. Photos of high-school graduates, standing next to the towering trees they planted a decade earlier, line the nursery’s office walls. The key to passing a business through generations, Scott says, is spot-on, no-nonsense service — and the fact that they raise more than 85 percent of what they sell. “Trees and plants that aren’t acclimatized might do well at first,” he says, “but they’ll freeze out come winter.” The nursery stands behind a half-price replacement warranty if any plant fails to grow in its first year. In their spare time, Scott and Joe, like the Sindelars before them, are Masonic Lodge members, volunteer firemen and Shriners. Scott also spearheads preservation and restoration efforts at Fort Atkinson and has a special knack for pyrotechnics. He’s the know-how behind some of the region’s biggest July Fourth fireworks displays and also the guy who fires the cannon launching a 150-pound anvil over a 65-foot flagpole — a pioneer-era alarm signal — during the annual Rendezvous Days living history exhibition at Fort Atkinson.